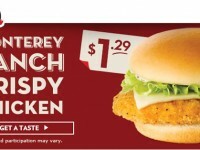 If you love the Wendy’s 4 for $4 deal, you are about to love it even more. 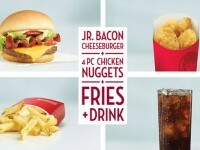 Wendy is now giving you the option of either the Jr. Bacon Cheeseburger or the Crispy Chicken BLT. For you unaware, the Crispy Chicken BLT has a crispy chicken patty with two pieces of bacon and a slice of American cheese. It is topped onto a toasted bun with tomato, lettuce, and mayonnaise. 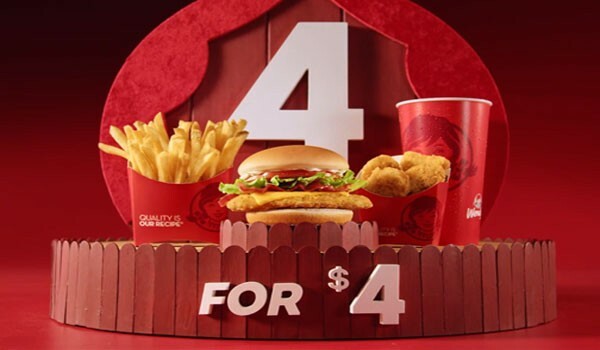 The 4 for $4 deal has been a popular offering from Wendy’s over the last couple of months, which now includes your choice of burger (or chicken sandwich), small fries, 4 piece chicken nuggets, and a drink.